Enjoy a luxurious condo in the Rockies. You will love to relax in front of your fireplace while looking at the mountains, enjoy a BBQ on your private balcony, or just sleep-in in your king size beds. Everything you need is there: fully equipped kitchen with breakfast bar, in suite laundry, stainless appliances, granite countertops, Wifi internet, 3 TV, DVD player, Netflix, heated outdoor pool, hot tub and more. We also offer a complimentary Park Pass during your stay. We are now proudly offering our guests bath products from Rocky Mountain Soap Co! Made in Canmore, enjoy natural products for the body and hair. Enjoy a locally roasted coffee by Mountain Blends Coffee Roasters in our automatic coffee machine. Take a walk downtown (10 minutes walk to downtown) to go shopping, enjoy the local brewery or sit on a patio to enjoy a good meal. Bring your bike and discover all the trails inside and around Canmore. Put on your hiking shoes and get closer to the mountains, why not go on top of it! Sunshine Village and Lake Louise ski resort are your best plan for those who are looking for the powder. Bring your skates and discover Canmore's Pond, for a wonderful family time. Born in Quebec, we discovered Canmore in 2000. Since that, we were coming back on a regular basis for hiking, scrambling, skiing and sightseeing. Since 2014, we now call it home. We love to be outdoor, and now we are happy to share our passion with our 3 kids, Louis, Mathieu and Emilie. We bought this condo as our first home in Canmore. We made it comfortable for all of you who wants to discover and enjoy this paradise. We hope that you enjoy Canmore as much as we do. We offer a local experience with Rocky Mountain Soap company products, Mountain Blends Coffee Roasters coffee, and a local treat for our guests!. We just love the view from every room and the balcony. We love to enjoy the well maintained year-round heated pool and hot tub. Linens provided for all beds, including sofa bed. Warm comfortable duvet covers. Unlimited underground parking spots, first come first serve. Maximum height 6'6''. Also available parking on the street. We provide 1 towel and facecloth per person. We provide hand towel and bath towel as well. Electric oven with ceramic stove top. Standard coffee maker. We provide you for first serve, and sugar as well. Serves 6 peoples easily, a lot of extras. Mixing bowls, measuring cups, hand mixer, Magic Bullet. We have plastic cups for use in the pool/hot tub area. Fully equipped kitchen. Lots of pots and pans, mixing bowls, measuring cups, cooking pan, etc. Everything you need for a great meal! Nice wood rectangular table, seats 6 comfortable. Cushioned chairs. 1 TV in each room with cable. 1 TV in living room with cable, Apple TV, Netflix and DVD player. We provide a wireless speaker that you can connect your phone via bluetooth. We spent spring break in this unit and it was wonderful. The unit was clean and relaxing. We especially enjoyed that the guest room and bathroom were connected to offer privacy for both couples in the unit. The property is beautiful and quiet. We enjoyed spending the evenings in the hot tub and the coffee shop on site was amazing. The owner took the time to ensure that the unit met our expectations on arrival. We look forward to staying in this rental again soon! We had a very nice time in the condo. It is nicely furnished and very well equipped. It was quite spacious and cosy for our family of 3. There is everything needed to cook. The Apple TV is very convenient and we enjoyed it after skiing. The heated underground parking is also very convenient. The jacuzzi and elevator are a little far but it is not a big deal when on vacations. The unit itself was very nice and perfect for 2-4 people. I did not understand that it is actually a hotel property and there were too many things to be cautious about not to do, like even ask the front desk a question. The other issue was that the owner ended up charging us for loss keys, which I explained that we had left them on the counter when we left, but still charged us fully for this. So I was not impressed with this and I know very well when and how to treat renters with our own properties that we rent. If you do rent here, be sure to take pictures of things how you left them and send those to the owner that day before you leave. 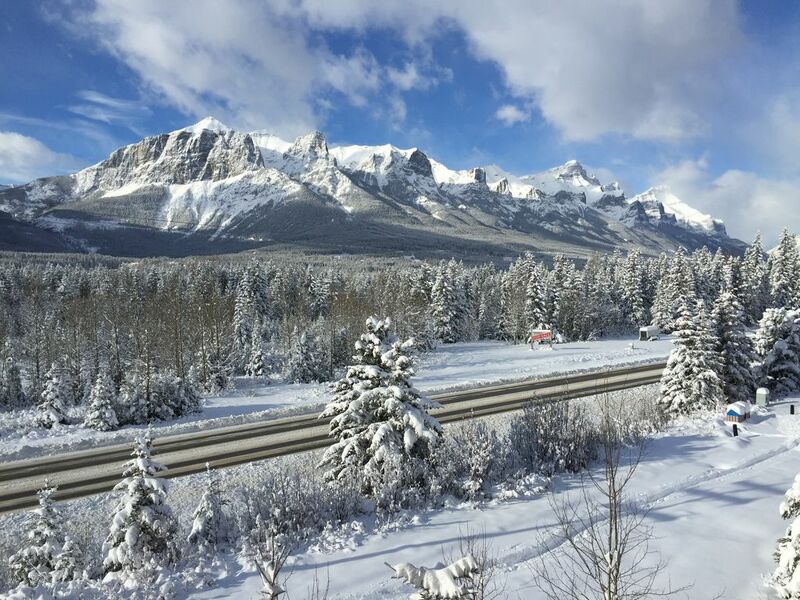 Canmore is a beautiful town to stay in when visiting Banff National Park! The accommodations were perfect for our visit. We had everything we needed and the view was spectacular! Thanks for a wonderful place! We loved our vacation to Canmore/Banff! Nestled in the Canadian Rockies, Canmore is the perfect getaway. Choose your playground from Kananaskis country or Banff National Park. Rates are subject to change until reservation is confirmed. Rental agreement must agreed to for your reservation to be completed.